HDMA is a registered patent of Luxembourg Bio Technologies (No. 101784522/8,524,898). HDMA present enhanced solubility (due to the oxygen atom in the carbon skeleton), which is the first property to be taken into account, having it’s great influence on the reaction yield and its performance in the automatic synthesizers. This enhanced solubility should help the removal of urea in the workup stage, formed during the coupling in a solution mode approach. 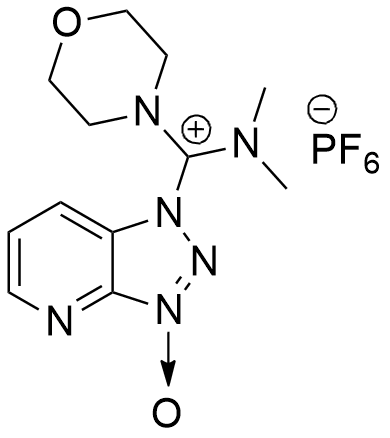 Couplings involving immonium salts, such as HDMA are carried out with an excess of base, at least 2 equiv., in this regard, coupling reactions carried out with HDAMA allowing the use of just 1 equiv. of base. This fact has great importance on the economical savings in the production of bulk quantities of peptides.